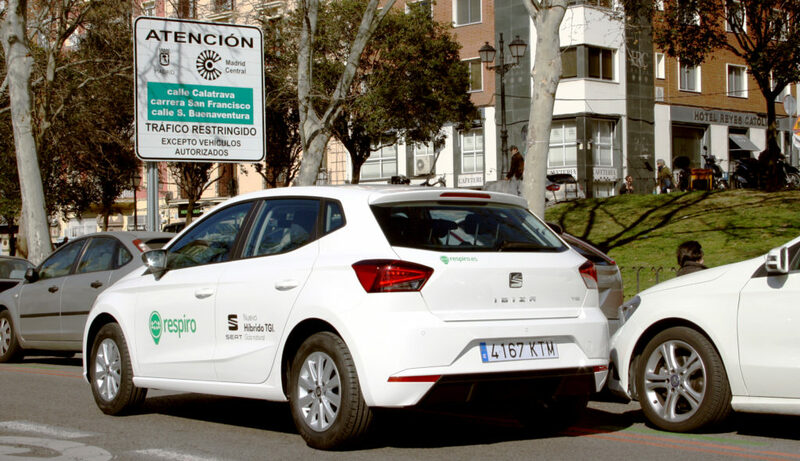 Respiro, the pioneering carsharing start-up that operates in Madrid, completed a major fleet renewal that involved the addition of 173 vehicles with ECO certification before the entry into force of the final phase of Central Madrid that began on March 16. The SEAT models chosen are the Mii, the Ibiza and the León in their 5-door versions, all with TGI technology (natural gas/petrol bi-fuel) with ECO label that allows free circulation through Central Madrid, the low emissions area from the city’s center. Aware of the saturation of vehicles, their underutilization and the impact of the cars on the cities, Respiro introduced cahe rsharing service in Madrid in 2010 and since then it has become an alternative for mobility for thousands of citizens who can rent a car when they need, either for hours or days, minimizing their environmental impact and saving costs. With the city’s new mobility ordinance that now only allows access to the center with CERO or ECO vehicles, Respiro has gone a step further and has renewed its Madrid Central’s fleet with vehicles that have the necessary environmental labeling, thus becoming the only fixed base operator that allows its users to access without limits or restrictions to the center of the city with all its cars. The new TGI range completes Respiro’s fleet, which already features other alternative fuel models with ECO labeling, and which in the coming weeks will be joined by new minivans and vans powered by natural gas manufactured by Volkswagen Commercial Vehicles. For years, SEAT has been committed to offering a leader mobility in terms of sustainability, with a wide range of models powered by natural gas available in the Spanish market, a country where more and more companies are opting for cleaner transport alternatives to meet the stringent environmental regulations. In this extremely encouraging scenario, AltFuels Iberia 2019 will take place on 11-14 June at IFEMA Trade Center, Madrid. The event will offer first level conferences and exhibition of vehicles of all kinds, refueling stations, components, plants, road and marine engines, as well as the entire universe of the alternative fuels industry with the latest technological developments, multiple options for networking, business and new advances. For more information, please contact info@altfuelsiberia.com.